Quimper, Brittany's oldest city, beckons those who need nothing more from a holiday than cobbled streets to wander through, a lazy river to cruise gently down and a wide selection of cafés and bars to sample. The holiday town of Quimper, spread around the junction of the Steir and Odet Rivers on the western edge of Brittany, is idyllic and charming. 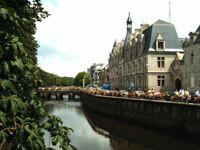 Fortunately, Quimper was spared the bombs of World War II and has escaped too much modern development, so the medieval character remains intact with old buildings overhanging narrow lanes and footbridges. The best way to see the city is by taking a boat trip down one of the rivers, or rambling around on foot. Visitors wanting to investigate the local crafts can tour the pottery studios that have been turning out internationally renowned Quimperware for centuries. There is also an Earthenware Museum (Musee de la Faience) to explore. Other attractions worth seeing include the Saint Corentin Cathedral, a very impressive Gothic building, and the Musee des Beaux Arts, located right next to the cathedral, which boasts some excellent paintings and sculptures and offers a good introduction to the cultural and artistic history of the region.